A unique gathering took place last week at Hodson Bay Hotel on the shores of Lough Ree. 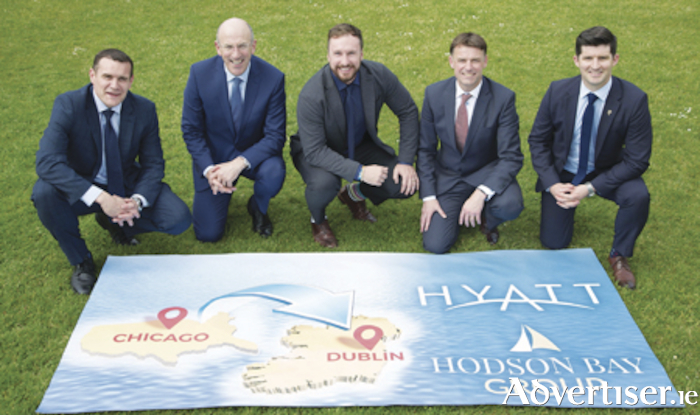 Jason Ballard, vice president of Hyatt Hotels Europe, joined John O’Sullivan, chairman of Hodson Bay Group, for the announcement of Hyatt Hotel Corporation’s first Hyatt hotel in Ireland: a 234 bedroom luxury Hotel in Dublin’s Liberties Gate due to open in March, 2019. Also joining the celebrations at Hodson Bay was a delegation from Chicago (the home of Hyatt Hotels ), led by the Toni Preckwinkle, the president of the Cook County Board, Chicago. Ms Preckwinkle’s trip to Ireland took in a visit to Hodson Bay as part of a strategic alliance between Cook County, Chicago and County Roscommon. The hotel will be situated in The Liberties. This location, which has been inhabited for more than 1,000 years, is the oldest part of Dublin, and is currently experiencing a complete regeneration as part of Dublin City Council’s plans to create a centre of culture and heritage for the city. Hyatt Centric Dublin will be within easy walking distance to Dublin’s major attractions, including the historic St Patrick’s Cathedral, Dublin Castle and Vicar Street, the city’s premier live-music venue. The hotel will feature a state-of-the-art gym and a design that aims to encourage interaction and engagement, with large windows at street level allowing for an immediate view of the bustling Dublin community outside. Guests will also be able to access a wide range of restaurant, bar, café and lounge options at the hotel, while an expansive conference space will open up for external events.